The list contained some (um, a lot of) mistakes. Even though I said, in the text of the post, that some of these “inventions” were in fact merely improvements to other people’s inventions (and provided links to sources about several of them), that information was generally ignored. No one should ever use a single random website (including this one, try as we might to get our facts straight) as an authoritative reference. Indeed, I’ve found quite a few other websites that either copy or refer to my list, as though it was a reliable source in the first place, thus multiplying the error. The wheel cipher. This one we know for sure: Jefferson created a device consisting of a series of 36 wooden disks on a spindle, each disk inscribed with the letters of the alphabet in a different order, thus providing a handy way to create and unscramble ciphered messages. It was intended to be used for transferring information securely during the American Revolution. A revolving book stand. Not terribly exciting, but this is essentially a turntable with five adjustable bookstands; it swiveled so any of the books could face the reader. The bookstands could also be folded down to make the stand into a cube. It appears to have been made according to Jefferson’s specifications. The spherical sundial. This small globe was marked with lines, and the semicircular bar that held it on its axis cast a shadow on it; which line the shadow aligned with told you the time. The plow moldboard of least resistance. Jefferson designed a new type of moldboard (the part of a plow that turns and lifts the soil) that would be able to move with as little effort as possible. The polygraph. No, not the lie detector. This was a much earlier use of the term, referring to an apparatus somewhat like a pantograph that allows the user to make two copies of a handwritten document at the same time. The letter-copying polygraph was invented by John Isaac Hawkins and Charles Willson Peale, but Jefferson made suggestions for improvements in its design, and used the improved version extensively. The Great Clock. Jefferson did not, of course, invent the clock. He did, however, design (but not build) a particular and very nice clock called the Great Clock, which was installed at Monticello in 1804–1805. It featured a gong that rang on the hour. The swivel chair. We know that Jefferson used a swivel chair, and there’s reason to believe he might have influenced the design for one particular type of revolving armchair. However, contrary to what I’ve read (and, ahem, written), Jefferson did not invent the very first swivel chair. The dumbwaiter. In Jefferson’s day, dumbwaiters were already being used in France and England, but what they normally called a “dumbwaiter” was basically a multi-shelf cart on wheels. Jefferson used those; he also had revolving shelves built into the dining room at Monticello that could be loaded without the guests seeing the slaves who did the actual work. In addition, he had a pulley-driven mini-elevator just for wine bottles that is more like what we would today call a dumbwaiter, but it’s unclear to what extent Jefferson himself was involved in its design. The pedometer. In 1525 by a Frenchman named Jean Fernel invented a device for counting steps, although the original idea for a pedometer can be traced back to none other than Leonardo da Vinci. Jefferson’s involvement was to bring a pedometer, of an entirely different design from what Fernel created, from France to the United States. 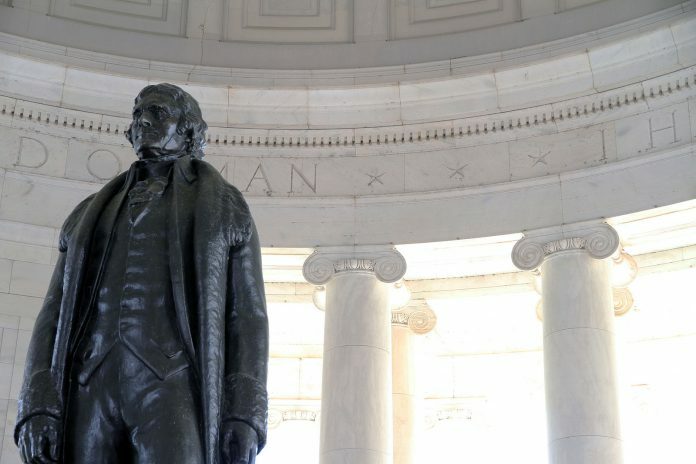 Jefferson may have improved the design, but we have no definitive evidence that he did. Several other people also claim to have invented the pedometer, and those claims are not exactly untrue, in that there have been numerous unique design approaches to accomplish the same underlying task. A macaroni extruding machine. Oh yes, Jefferson had one, all right, and he was by all accounts quite fond of pasta, but the machine he owned was acquired from an Italian source, shipped to the U.S., and assembled there. 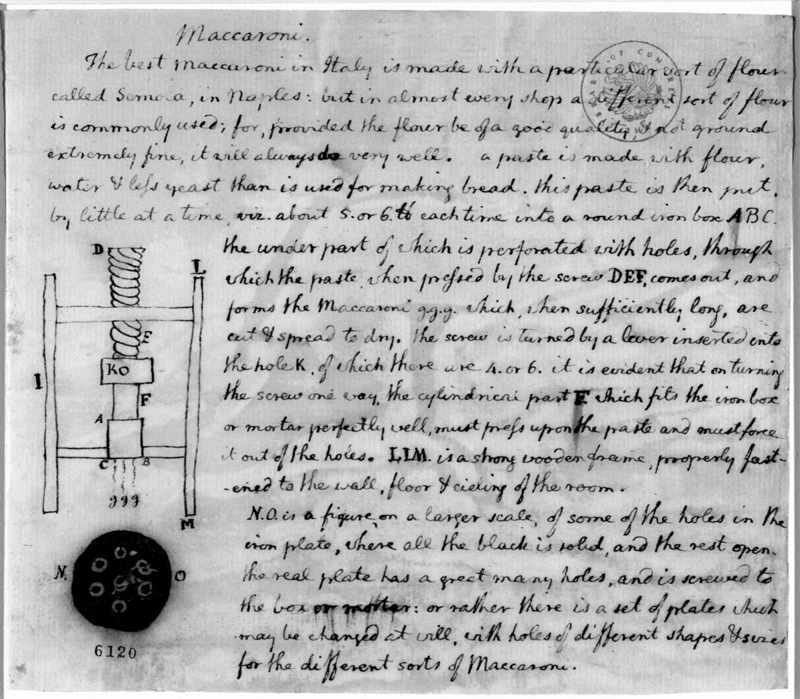 It wasn’t Jefferson’s design, although he did indeed make a drawing of such a machine. Although I can’t tell for certain from the drawing, my impression is that this extruder doesn’t make pasta tubes, and certainly not the elbows we most commonly refer to as “macaroni” today. The recipe for macaroni and cheese. I wanted this to be true. I truly did. But there’s just no evidence to support it. Jefferson may well have helped to popularize macaroni (in one form or another), but he was certainly not the first person to combine pasta and melted cheese. The hideaway bed. I have found no evidence that Jefferson even used or owned, let alone invented, any form of hideaway bed. He did, however, have an alcove bed situated between two rooms, and some people apparently believed he had a mechanism to hoist the bed into the ceiling, though none was ever found. So there you have it: the best information on Jefferson’s inventions I can produce today. It falls…rather short of my earlier claim that he invented all 12 of the items mentioned, and for that I apologize. It is true that Jefferson declined to patent any of his inventions (or improvements), apparently out of a belief that his inventions should benefit all of society, not just himself. While that’s quite noble, it also means we don’t have documentation that might otherwise prove that he created the designs.